New FREE Classifieds now active............ Give 'em a try! If you are in any way attached to the hobby of Antique Tractor collecting and/or restoring, we want you to become a regular visitor to this website. We hope to give you anything and everything we can that has any kind of involvement with old antique or vintage tractors and farm equipment. We will continue to do everything possible to keep it interesting, informative and helpful to you! We encourage you to do more than just stopping by. If you are truly interested in our hobby, check out what we have available, contribute if you can and if you can't find what you are looking for here, let us know and we'll try to add it for you! If you're looking for tractor parts or restoration resources, you might find what you're looking for in our parts listings. As you browse around the site, click on the images for more good Tractor stuff and as you're browsing to find everything you need to know about tractors and other relevant information, we hope you enjoy your visit! Follow along on a series of stories about the restoration of an old John Deere hand crank "A"...it'll be fun! Click on the graphic at the left to see more of this fine restored old tractor. There is a literal ton of antique tractor, implement and old equipment stories and resources in these pages. You don't stop at the first old tractor you find..... Why stop only on this page? Read about other's experiences with Antique Tractors. This is a regular new feature at the Fastrac Web Site!! Before we started the new Tractor Forums, there were a lot of questions posted to our old Q&A page. If you're interested you could read them......maybe something is still there that could help you! . This is a feature that may be useful! Coverage of the 2010 Red Power Roundup at Laporte, Indiana. Check out the pictures of some of the stuff we saw! looked so real and with as much detail as this one has. Check it out! 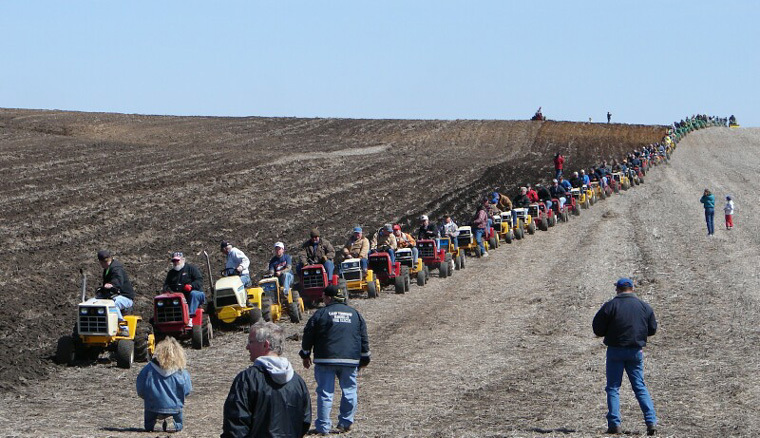 One of the most fun days for Lawn and Garden tractor collectors (and the big tractors, too) is attending a plow day. The picture on the left shows one of these events back in 2010 in Rockford, Iowa. When I first saw this picture, I thought it was amazing. It looks like these guys are having fun. Want to see these machines in action? Check this out!